Since the ideas of Collingwood often dominate this blog, one may ask why they influence me. My old letter provides some evidence, since I wrote it before I had read anything by Collingwood but The Principles of Art. The present essay has the first of this blog’s several mentions of the slogan verba volant scripta manent, which may not mean what we tend to think today. The indicated pensée happens to allude to the definition of God as une sphère infinie dont le centre est partout, la circonférence nulle part; this definition is not taken up here, but it is in later posts, apparently without recollection of its use by Pascal. When do our thoughts progress, and when do they only confirm what we have always thought? In December of 1987, I was between college and graduate school. I was living with my mother in Virginia, doing some tutoring at my old high school, waiting for inspiration about what to do next. Inspiration did come in the course of the following year, when I was working at an organic farm in West Virginia. I was going to apply to graduate schools in mathematics or philosophy (earlier I had considered also physics); then, in a dream, I understood that I had to do mathematics. Meanwhile, among other things, I exchanged letters with college classmates. I am going to quote and examine a letter written by me whose precise date is 13 December 1987. I am able to transcribe my handwritten words, because I kept a photocopy of them. The photocopy sat in a folder in my mother’s house, in my old room in the attic, for more than twenty-six years. Now that I read again what I wrote, I find ideas such as I have found (and agreed with) more recently in Collingwood, especially in his early books Religion and Philosophy (1916) and Speculum Mentis (1924). When I wrote my letter, I had recently read Collingwood’s Principles of Art (1938), a copy having been lent me by my former art teacher, Sanfred Larson; but I see no direct influence of this in the letter. For now, I am tutoring some students of chemistry and precalculus at my old school in Washington. I enjoy working with most of my students, who are generally hard-working and even enthusiastic. I am especially glad to be teaching mathematics. I say “teaching” because my students could hardly teach themselves with the austere text they have, and what they are shown in class is not always what, or enough of what, they need to see. The text that I refer to must have been the text written by the students’ teacher, Donald J. Brown, who had been my teacher as well. For several of my own university courses, I have imitated Mr Brown’s practice of writing his own texts. Like Mr Brown, I write austere texts. But I say that my texts are not supposed to be a substitute for a live teacher. A text cannot be all things to all students. Education arises from the personal interactions of teacher and student. When I go to teach my own classes, I usually carry my notes and my board-markers in a bag from Homer Kitabevi, a bookshop here in Istanbul whose slogan is Verba volant, scripta manent: [spoken] words fly, writings stay. The saying is attributed to Cicero in Çiğdem Dürüşken (ed. ), Latince Deyişler ya da Yaşamın Renkleri [Latin Sayings or The Colors of Life], Istanbul: Homer Kitabevi, 2004. The meaning of the saying would seem to be that books are permanent, and this makes books important. But perhaps the original meaning is that written words do not fly up by themselves into the understanding of the reader. They just sit there on the page, until the reader learns to coax them out. qu’importe qu’un homme ait un peu plus d’intelligence des choses? Indeed, what does it matter whether one knows more or less of, say, physics or philosophy, since one will never know all? Perchance it matters not, but what one pursues does matter. A biographer of mathematicians called Pascal the greatest mathematical might-have-been. He would have been greater had he not neglected his subject. I imagine Pascal, with his rhetorical question, trying to dispel doubts about his own neglect of science. For the record, my text of Pascal was in the Brunschvicg edition (as published in Paris by Flammarion in 1976); the cited Pensée was number 72 (corresponding to 199 in the Lafuma edition), in the section headed, “Misère de l’homme sans Dieu.” The biographer of mathematicians was Eric Temple Bell, in Men of Mathematics; but I was quoting him from memory. The doubts that I attributed to Pascal were surely my own doubts about not yet having set out on a career. les parties du monde ont toutes un tel rapport et un tel enchaînement l’une avec l’autre, que je crois impossible de connaître l’une sans l’autre et sans le tout. He has in mind that since we, as finite beings, cannot know the all, the infinite, we cannot even know one thing, for knowing it would require knowing its relation to all else. One could conclude otherwise, that since we are a part of infinity, we are related to all of its parts and so we may hope to know these parts and thus infinity. Of course, the original assumption of the relatedness of things is hardly a truth from which to draw conclusions. Is it true? Your answer of “yes” or “no” cannot mean much to me unless I can already come up with an answer for myself. At least, I must know what it would mean for such a question to have an answer, but such knowledge is not easy to get. … is it really justifiable to describe a human personality as finite at all? We saw reason to maintain in a former chapter that a mind was only definable in terms of the object of which it was conscious; and if God is infinite and man is really conscious of God, it seems to follow that man thereby becomes infinite. It is sometimes said that for this very reason man can never know God; but to lay down a priori what a given mind can and what it cannot know in virtue of its own constitution is to begin at the wrong end. The mind is what it makes itself; and its finitude or infinity (if the words mean anything) consists merely in its failure or success in the attainment of its desire. History is the knowledge of the infinite world of facts. It is therefore itself an infinite whole of thought: history is essentially universal history, a whole in which the knowledge of every fact is included. The whole, universal history, is never achieved. All history is fragmentary. The historian—he cannot help it—is a specialist, and no one takes all history for his province unless he is content to show everywhere an equal ignorance, an equal falsification of fact. But this is a fatal objection to the claims of historical thought as we have, without favour or exaggeration, stated them. History is the knowledge of an infinite whole whose parts, repeating the plan of the whole in their structure, are only known by reference to their context. But since this context is always incomplete, we can never really know a single part as it actually is. … History as a form of knowledge cannot exist. Thus history is the crown and reductio ad absurdum of all knowledge considered as knowledge of an objective reality independent of the knowing mind. Therefore reality is not independent of the knowing mind. I seemed to suggest something like this in my letter: “Everything is connected” has no meaning independent of this or that person who thinks about it. This may be true of all statements; but it is less obviously true of mathematical axioms, which in theory at least can be used to crank out theorems mechanically, without critical intervention. If one accepts uncritically that everything is connected, then one may conclude that there can be no differences at all between things, and so all is one. Since evidently there are differences in the world, something must have gone wrong with the original assumption. At this point, therefore, the reader is confronted with a choice. If he is satisfied that the traditional rules of classification must be rigidly applied to every concept whatever, and that to think of the specific classes of a genus as overlapping can only have fatal results for the whole structure of thought, he should read no farther in this essay. But if he is prepared to admit, I do not say that he understands how such an overlap is possible, but that philosophers may conceivably have been right so consistently to affirm it in spite of their own logical rules, then I invite him to join with me in the following experiment. Let us assume that traditional philosophy in general is neither a body of truths to be blindly accepted nor a mass of errors to be repudiated wholesale, but a mixture of good things and bad; and in particular let us assume that on this question it has not been wholly at fault, but that in some sense, to be better discovered hereafter, an overlap of classes is characteristic of the philosophical concept, and may serve to distinguish it from those of exact and empirical science. Let us see where this assumption leads us. The remainder of the Essay is the result. The student of Zen is said to meditate on such a story until he can give an account of it. Methinks such an account is a kind of account of the law of contradiction,—but then, I could not understand the account until I could give it myself. The student then goes to the roshi and, during the private interview known as sanzen, an interview conducted in a formal and specifically prescribed manner, the master gives the student a koan which he is now to meditate upon. At definite times from then on the student is expected to go to the roshi for a like interview, and during each interview to express to the master his view at the moment of the inner meaning or content of the koan on which he has been continuously meditating. When the student attains correct insight into the koan, the master, to test his understanding still further, will ask him to bring a word or phrase, preferably from some old Chinese proverb, pithy saying, or poem, that conveys in secular words the inner meaning of the koan. These words or phrases are known in Japanese as jakugo. I have yet to find a suitable English word for this expression, but perhaps “capping verse” might do. When the student has brought the correct jakugo—and almost every koan has a fixed jakugo—the master will give him another koan to meditate on. What is the right answer to a koan? There are many right answers and there are none. There is even a book in Japan, hard to come by, which gives proper answers to each of these mind-openers. What a joke! For the koan itself is the answer, and by the time there is a right answer to it Zen is dead. These words are belied by Ruth Fuller Sasaki. It is apparently not a joke that there is one right answer to a koan. The joke is to suggest that the answer can be written down in a book, and that anybody can read the book and have the answer. Verba volant, scripta manent. The student must make the answer fly; the teacher is there to see that this is done. Many people say to me, “Zen is so difficult to understand. I have read a lot about it, but, though I think I understand what it’s about while I’m reading, afterwards I realize I haven’t understood it at all.” Of course there are others who, without having read a single primary Buddhist or Zen text, think they know all about it. How many hours have I not spent in my Kyoto temple listening to people, usually Americans recently come to Japan, tell me just what Zen is. Zen Flesh, Zen Bones ends with a page headed “What is Zen?” A metaphorical answer is suggested, based on a Hindu story about a fish who wonders what the sea is. This is followed by the rubric “Another answer: ” The remainder of the page is blank (except for a footer, with page number, such as appears on every page of text). If this means you must find your own answer, that is fine as far as it goes; but it does not make you an authority who can lecture to others about what the answer is. Kusada continued in concentration for another year and a half. His mind became placid. Problems dissolved. No-Thing became the truth. He served his patients well and, without knowing it, he was free from concern over life and death. This entry was written by David Pierce, posted on June 30, 2014 at 1:19 pm, filed under “God is a circle …”, Collingwood, Education, Philosophy, Principles of Art and tagged 2014, Buddhism, Donald J. 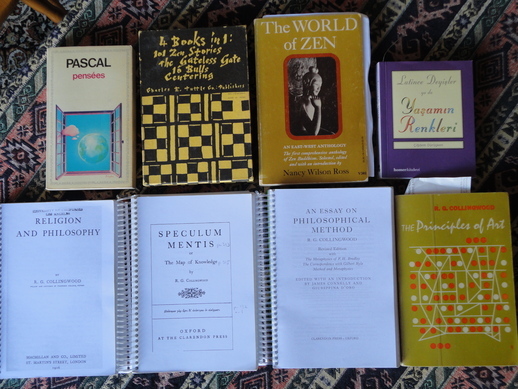 Brown, infinity, Nancy Wilson Ross, Nyogen Senzaki, Pascal, Paul Reps, Ruth Fuller Sasaki, Speculum Mentis, verba volant, Zen. Bookmark the permalink. Follow any comments here with the RSS feed for this post. Post a comment or leave a trackback: Trackback URL.